« Come to a Party – Dressed as Tube Station! 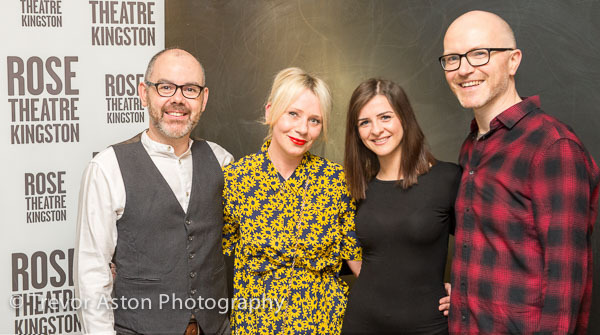 Kingston’s Rose Theatre get me to photograph all their press night parties. The brief is to capture the celebrities and cast. A couple of recent productions have been directed by Trevor Nunn and consequently I have quite a lot of Trevor Nunn pictures. Possibly enough to start a photo agency, albeit rather specialised. Specifically, pictures of Trevor Nunn holding a glass of wine. He’s always very kind and patient when I point my lens at him, yet again. Trevor Nunn did not direct ‘Beryl’ at the Rose, it was Rebecca Gatward. The play was written originally for radio by the fantastic actor, Maxine Peake. It tells the true story of a British world champion most people have never heard of. Beryl Burton was twice world road race champion and won the British National Championships thirteen times and claimed five pursuit gold medals in the World Track Championships between 1959 and 1966. I’m a cyclist and really enjoyed the production which saw the cast of four playing over a dozen parts each. Beryl Burton’s daughter, Denise Burton-Cole said: “We are thrilled as it’s an outstanding play and it’s great that more people will see it”. This entry was posted in event, public relations, theatre.